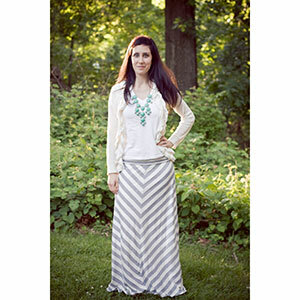 Simple a-line skirt that can be made plain or chevron using striped fabric. Features a fold-over or a simple straight yoga waistband. Wear the yoga waist up for more coverage and support (high-rise), or folded down for a low-rise look. 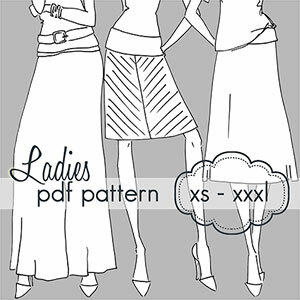 Pattern includes NINE different length options. Petites, regular and tall. Sizes XS through 3XL. Recommended fabrics are cotton spandex or cotton jersey, ribbed knit, interlock or any knit with at least 50% stretch. Lycra spandex for the waistband or any knit with at least 75% stretch.